I installed Emby 4.0.2 yesterday (3/14/2019 -- happy pi day!). After building my library, I found that some folders (with lots of sub-folders) are being represented as video files rather than folders. As you can see in the images, the Sci-Fi folder (see the contents in the second image) appears to be just another video file. As you can see, that's not the case. How do I get Emby to recognize it (as well as the Animated, Mystery -- with dozens of complete sets of tv shows -- and and Music -- which contains musical movies and TV shows not music files) as folders rather than video files? If I click on any of those in the library, I get the same view as if I were clicking on a video file, but there's nothing to play. I'd also point out that the "video" that was metadata'd as "Tuesday's Documentary" is also a folder with 35+ or so sub-folders and nearly 800 video files, many of which will have TVDB and IMDB IDs. Thanks. But I already read through that guide. My point is that multiple folders are recognized as folders but others are not. I want to understand what the inconsistency is here. As an aside, my folder structure roughly follows the recommendations in the guide, with the exception that content is broken down by genre first. Which gives me the thought that perhaps I could create libraries for each genre and combine the whole shebang into a collection. But that still doesn't answer my question: Why is the Action folder treated as a folder, while the Sci-Fi folder is treated as a single video? The library scan didn't (as it did with the Documentary folder) try to apply metadata to make the "Sci-Fi" or "Music" (which are assuredly *not* music videos, they are theatrical movies) as a "movie"
My apologies if I wasn't clear about that. What I want to know is how to get Emby to recognize *folders* as folders, just as it does with other folders in the same library. I may be missing something important, but I don't see it and it's definitely not in the link you posted. That said, I really appreciate you trying to help. Thanks! what kind of library did you specify? looks like you have movies and tv and other stuff all mixed into 1 folder, so that'd be a mixed content library. Yes. That's exactly correct. I selected mixed content for the video library. I do find those categories rather arbitrary. Although Kodi just has Movies *or* TV, so Emby is not as restrictive as Kodi. Then again, MythTV doesn't care about that at all, as long as it's video. And MythTV''s library scan engine is hugely superior to that of Emby or Kodi. I just got a Roku, so I'd like to use it to serve up video and music, but MYthTV doesn't have a Roku app (well, exept for the MythRokuPlayer ( https://forums.roku....hp?f=28&t=33704 ) which requires significant work to set up and is beta quality at best. What's worse is that MythTV's DLNA server doesn't play well with Roku Media Player or any other Roku media app. Kodi's restrictive files policy drove me to Emby, but it's not much better (and there are apparently other issues -- which is what I'm trying to resolve here in this thread). If I can';t get Emby to play nice (or at least consistently), I guess I'll go with Plan A (a mini PC as a MythTV front-end), but it doesn't have Acorn TV support (a subscription I received as a gift), but the Roku Express was only $30 and I have more HDMI ports (in addition to the ones for my Tivo and Roku) on my receiver. In any case, I'll keep pounding on Emby for a while (although I'm disappointed to see that 'shuffle all' is unavailable and Emby's playlists won't support my 20,000 music tracks anyway) and see how well I can get Emby working with the Roku, as I hate not being able to make technology work properly. In any case, all that said, I'm still really confused as to what's causing Emby's inconsistent library behavior with folders. Hopefully I can work that through before I go and buy a MythTV front end. Which has significantly broader codec support and pretty seamless on-thje-fly transcoding. Do you have any thoughts about creating separate libraries for each genre of video and putting them in a collection? Might that give me a better shot at having all my folders (each of which contains significant numbers of sub-folders) be recognized as folders rather than useless "video" files? What content type did you set for the library? what are the contents of the sci-fi folder? The folders that contain movies (see below) just have the movies plus some have a subtitles folder and a .meta folder for Tivo metadata. The TV shows have folders for each season plus .meta folders in each season. The Fantasy folder has a dozen or so sub-folders, some (TV shows) with folders for each season, again all with .meta and some with subtitles folders. Please note that the Music (not music, musical movies) and Mystery (with 150+ sub-folders of the kind I mentioned above and 2000 or so videos, all of which should have unique IMDB/TVDB ids) folders see the same treatment as the Sci-Fi folder. 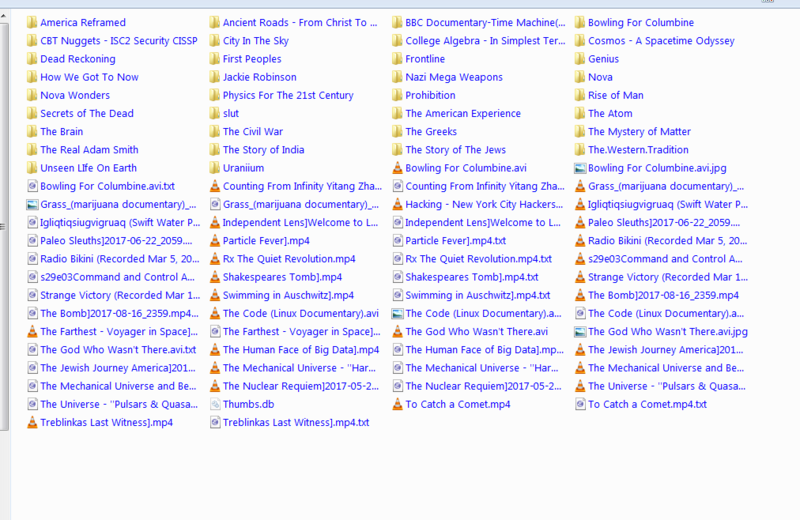 Even more strangely, Emby thinks the Documentary folder (800+ videos and lots of sub-folders) is a single video called "Tuesday Documentary"
here are pngs of the Emby Video library and the contents of the Sci-Fi folder. Ok well i think we know why Sci-fi is not treated like a single video, because that's not what it is. Is there an issue with Sci-fi then? Can we look at the Documentary folder? Thanks. >>Ok well i think we know why Sci-fi is not treated like a single video, because that's not what it is. Is there an issue with Sci-fi then? Ok, if you'd like to try the beta server, I think there's a good chance this will be improved there. Thanks. I would get that from here (I'm running Fedora 29), yes? I'd be inclined to wipe out the DB and all the metadata (I kept that separate from the actual media) and erase EMby 4.0.2 and do a clean install. Would that be your recommendation? I really appreciate your time and assistance, sir. I'll let you know how it goes. Either way is fine. Thanks. Well, I did as you suggested and now the folders are recognized as archives of specific (and unrelated) TV shows, just as the Documentary folder was (and is again in the new install). The initial library scan has completed (which never happened with v4.0.2), so there's definite improvement. 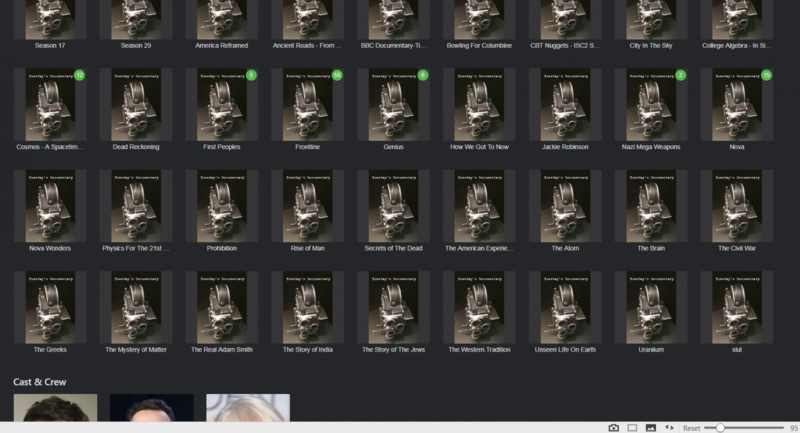 Do you think that creating separate libraries for each genre folder might yield better results? One very positive development with the beta version is that when viewing music (actual songs, not the Music folder with videos in it) in the "Songs" view, I can successfully shuffle, at least through the web interface. If this will work the same way via the Roku client, Emby will have addressed a big part of why I've been investigating various media platforms. Ever since Tivo broke PyTivo's music streaming, I've been trying to find something reasonably usable to replace it. Tivo does support Plex, but Plex requires you to allow them to spy on everything you do with their platform, even if all the media in use resides on your own equipment. As such, I won't use Plex (even though they have a TIvo client). I was using Ampache ( http://ampache.org/ ) via the Vewd (https://www.vewd.com/ ) custom URL app, but that was incredibly slow, and presumably like Plex, they record every URL requested -- again even when all media is local. In any case, assuming that the Roku Emby app will shuffle music from the "songs" view, Emby is a big improvement for me. As you've probably figured out, I've been looking at media management/streaming software for quite a while. My primary goal is to eventually get replace Tivo and go with something open source (like Emby) that doesn't spy on me (which Tivo most certainly does). I will continue to work with Emby, and hopefully it will meet many of my media management and audio/video streaming needs. Especially since the Emby community (not least you) has been really helpful. That makes a big difference to me.